Uniforms, be it in schools or at workplaces, are used to distinguish employees of various designations. It is a widely discussed debate whether or not uniforms are needed at workplaces, because not only are they plain, but they also make the job look uninteresting. Uniforms do have its fair share of pros and cons. Usually, they are shaped unflattering to the body of the wearer, unless it’s a high profile job, such as a stewardess where a neat and flattering uniform is necessary. Uniforms can vary from being a single clothing to a three-piece set. Uniforms play an important role in the organization. They act as an identification mark for customers to spot company employees. Moreover, the employees also get rid of spending special formal clothes for office purpose. With the help of uniforms, employees can save both time and money. The uniforms also help to market or advertise your company’s brand. Though uniforms have various advantages, there are a few people who still dislike wearing uniforms at work. Not only uniform helps us look cohesive and disciplined but making it mandatory by the company will be backed by several other intentions. The following are some of the advantages of uniforms at work. A uniform basically is a walking advertisement for the company. When stepping out in the world, or are working people usually take notice of your uniforms and through company logos and emblems people get to know what the company name is. This creates a sense of brand awareness within the locality and within the working society. They acts as an effective marketing tool and give a good first impression to the customers. It can help you to promote your business more efficiently and competently. Uniforms can give your company more exposure and publicity. Hence, increases brand retention in people’s minds. 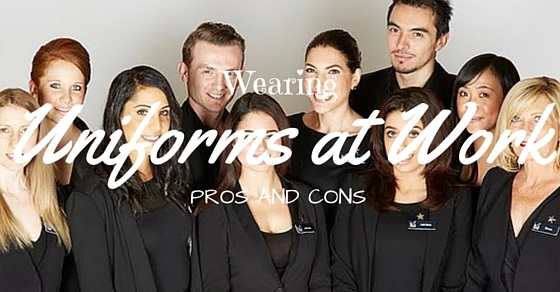 Uniform helps the workers bring a sense of identity within the company and the organization. It also achieves for them a sense of belonging. Wearing the same clothes would lead to a feeling of team spirit, and make the employees feel that they are a part of the company. This enables the employees to be more into the company and be more active inside the company. It also increases a feeling of loyalty and allegiance from the employees towards the company. Your clothing will become an identity of your company and people will identify as an employee of that company. Uniforms usually give their employees a professional and an executive look. This pleases a customer when he first sees the employee. Moreover, it builds a sense of trust and confidence to the customer when interacting with a uniformed individual. Uniforms help employees to dress smartly and effortlessly. The uniform creates a professional feel and sets the standard of the customer of what they expect from the employee. This shows how strict and disciplined the company is to their employees. Also, the citizens also tend to trust uniformed individuals more because uniforms make it easy for people to recognize the individual as an authorized personnel in that area. Uniforms are an effective way to provide a good first impression to the customer about the company. If the employee is dressed smartly and is dressed to impress, then the customer will feel more comfortable while interacting with the employee. Also, wearing a uniform to work also helps you to get ready of any unplanned or unexpected situations such as meetings. Moreover, it is better to apply a dress code in companies instructing employees on what to wear and what not to wear. This helps to prevent the employees from wearing any inappropriate clothes, depending upon the type of work field that the employee is involved. For example: In the corporate world, it is always necessary to wear pants and full sleeve shirts with a proper tie rather than wearing just a casual shirt with jeans. The former gives off an executive and polished feeling while the latter gives out an unpretentious and an easy-going feel. In large organizations, uniforms come as a blessing in disguise, because it saves the personnel so much time and gives him more opportunities to think rather than waste half of the morning thinking what to wear for office and trying to match the colours of his/her work clothes. Moreover, in most parts of the world especially in second world countries, it is considered as an honour and a privilege to receive a uniform for work. Also, the personnel doesn’t have to spend a lot, on a wide variety of work clothes. One of the fact about uniforms is that as the name suggests, uniform in literal sense means to be same throughout. That is the basic function of a uniform, that is the employees should be seen same in an organization irrespective of their social status. It doesn’t matter if they are rich or poor, while working for a company, everyone is treated just the same. Hence, uniform brings people from all backgrounds onto one platform. Research shows that implementing a uniform system and a dress code within an organization would lead to more productivity because the employees will develop a professional mind set and starts to be engrossed in work. This develops a fine line in the mind of the employee that uniform is for their professional life while casual clothing is suitable for their social activities. Usually this applies for jobs that need protection for both the employee and the user. In such cases, wearing a uniform is a mandatory issue. Such uniforms are carefully designed and are validated and checked by the health and safety department of that area. For example: Firefighters use heavily protected uniforms that protect them from flames and excessive heat. It also helps the citizen to recognize the employee. In such high-risk cases, wearing a uniform is a must. People wearing uniforms tend to care more about their peers and colleagues and try to ensure mutual growth from both the sides. They try to foster this quality and makes sure that the whole organization has the chance to thrive and prosper. There are certain organizations that are focused on the customers such as hospitals, electronics showrooms, automobile showrooms etc. When wearing a uniform in such jobs, it gives a sense of solidarity and unity to the customer and the customer feels more comfortable to call the employee for assistance. Also, it looks good for the company from a third person objective. So the above mentioned are some of the points describing few uniform pros and reasons for why uniforms are good. The following are some of the disadvantages of uniforms at work. Poorly designed work clothes can result in restricted performance. This may cause difficulty for the employee since they find the uniform constricting their work output. For example, for flight stewardesses wearing pencil skirts and high heels may look good, but by the end of the day, it causes discomfort to the individuals. Wearing high heels for a long amount of time can cause muscular pain, painful soles and cramped legs. Hence, in an organization required to wear uniforms, try to consider the feelings of the employees too, since they’re the ones who have to wear them for the whole day. In certain organizations, if they don’t specify the type of material to wear for work. It might end up with the employees pushing the limits and wearing inappropriate clothing for work. If they don’t meet the prescribed uniform standard set by the organization, it can cause the employees to be punished or warned by the higher-ups. By wearing uniforms in an establishment everyone will look the same. This restricts in identifying employees from one another. Wearing the same uniform every day might be boring for the employees too. Allow them to personalize their uniforms by wearing a certain belt, using brooches and cuff links and so on. This gets rid of the “bland feeling” felt by the employee towards their uniforms. It can also affect the working ability of the employee if they are dressed same as the others in an organization. Try to have some level of distinction between employees or try to make the dress code a less specific rather than following a strict uniform regiment. The main factor that haunts uniforms is that there is usually a large number of employees who hates the uniform being imposed on them, since they feel that wearing a uniform makes them more restricted and removes their own identity that sets them apart from the crowd. Moreover, the employers have to spend from their own pay package and pay for expensive work clothes or uniforms once in a while. This can cause discord among the employees and they’ll rebel against the organization. Furthermore, if the uniforms are poorly designed or have vibrant colours, it may also look bad to the potential customers. Employees wish to wear something smart to work, wearing clothes of their own choice and not by the set of clothes prescribed by the company. Most of the uniforms do not fit for people for all body shapes and sizes. This may look weird on such individuals and they might feel awkward and aware of their surroundings hence, hindering their work. Branding the company just because of the uniforms is really a bad idea. Do not just rely on such tactics. Instead, try to hire more trustworthy and efficient employees who can do the job and get the work done. This is what makes the company more successful and well-known. Try to be recognized by your work and not by the uniform you wear. This is where the real success of business lies. Moreover, branding a company through the uniforms can be tiresome for the employees as they always have to keep in mind that they are a part of this institution. This is a guaranteed drawback of applying a uniform in an organization when employees who cannot carry the uniform efficiently are in front of customers or potential stakeholders, it might look bad for the company. It makes the customers feel that either the employee doesn’t care about the company ethics or the company doesn’t care about the employees. One of the main disadvantages of uniforms is that it takes a lot of time changing into and out of your uniforms. Furthermore, in industries where you have to work in the environment where you might get stains on your clothes, for example in oil rig, or a mechanical workshop, uniforms are a great way to make your own clothes stay clean and fresh. But this also means that it requires a considerate amount of money and time to get your uniforms cleaned to make them wearable condition for the next day. Uniforms cannot please the religious sentiments of all individuals. Religious sentiments reflects the upbringing and values that the individual believes in his/her religion. Wearing a dress/ uniform that does not obey or follow such values might be burdensome for the employees. While designing or implementing a uniform try to value the beliefs of the employees. For example, people who follow a certain religion might have to wear a head gear all the time as a part of their belief. If, the uniform doesn’t allow such an individual to wear such head gears, it feels that the company disregards such employees and it can cause an opportunity for the employees to rebel against the company. Hence, a bad name for the company. Uniforms can make employees be aware of their surroundings and aware of the society. This creates a feeling of being watched by the people all the time. Moreover, if the uniform doesn’t flatter the body type of that certain individual it adds more to their woes and discomfort. They feel more ashamed about their body type when compared with others who have different body shapes and might be able to elegantly carry the uniform well. They might be criticized about factors such as their weight, colour, height, race etc. This can decrease their self-esteem to an all-time low. Most companies tend to change their uniforms once in a while, to prevent monotony. This can be a bit expensive for their employees as they have to change their uniforms again, for once every 5 years or so. Moreover, buying a uniform can be a bit expensive and if they are not of good material it can lead to wear and tear hence, more spending on uniforms. These expenses are not taken by the company but rather are considered as personal expenses by the employee. In conclusion, uniforms can serve as a form of identity for the company but at the same time, it can be a liability for the employees. When implementing a uniform dress code try to take a survey about how employees feel towards the idea of wearing a uniform. Moreover, to make the uniform dress code try to include the opinions and suggestions from the employees, run a small uniform debate. Likewise, instead of forcing them to wear a fixed uniform, try to set up a wide variety of dress codes. This gives the employees a large number of options to wear and be dressed smartly for work.